London, United Kingdom – Discover, the privately owned, geology-led, oil and gas exploration company specialised in deepwater petroleum systems, is pleased to announce the ratification of its Production Sharing Contract (the “PSC”), covering offshore blocks 35, 36 & 37 (previously named blocks A, B & C), by the National Assembly of the Comoros (the “National Assembly”). Parliamentary approval follows on from the signing of the PSC by the Government of the Comoros in March 2013, in full compliance with the country’s international standard Petroleum Code ratified in December 2012 by the National Assembly. The PSC license area of c. 18,000 km2 is adjacent to Mozambique Areas 1 and 4 and is located in the western part of the Exclusive Economic Zone of the Comoros, where there have been recent discoveries of giant natural gas accumulations by Eni in Area 4 and Anadarko and its partners in Area 1, and in which the Discover management team were involved through their previous company, Cove Energy plc. 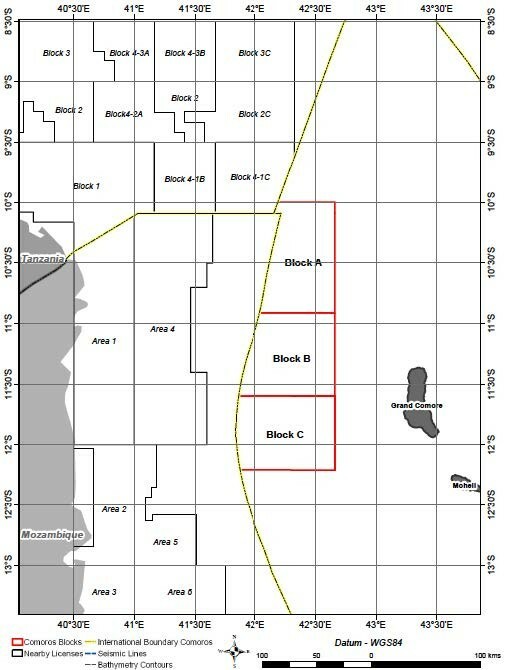 Existing 2D seismic data suggests the reservoir play fairway hosting these gas deposits extends in to the license area covered by the PSC. The parties to the PSC are Discover (60%, through it wholly-owned subsidiary Discover Exploration Comoros B.V.), Bahari Resources Limited (“Bahari”) (40%) and the Government of the Comoros. The partnership is entering into a 4-year exploration period and will shortly commence an extensive 2D in-fill seismic survey covering the PSC license area. Discover and Bahari will also invest in the training of local personnel and in local community development programmes. In December 2013, global alternative asset manager The Carlyle Group (NASDAQ:CG) announced a majority investment in Discover. The equity investment of up to $200m over the next three years will fund operations in the Comoros as well as other opportunities. This was the first investment by Carlyle International Energy Partners (“CIEP”), a fund that focuses on oil and gas exploration & production, midstream, oil field services and refining and marketing in Europe, Africa, Latin America and Asia. Discover is an unlisted, geology-led, oil and gas exploration company headquartered in London. The Company was founded by the same management team responsible for the successful creation of Cove Energy plc in 2009 and its eventual sale three years later for £1.2bn. Led by Executive Directors Michael Blaha, John Craven and Michael Nolan, the management team has strong technical expertise in deep water petroleum systems, solid industry reputations and continuing relationships with major oil companies. Paul Griggs and Alexander Mollinger, both former Cove associates, are also part of the management team. Discover’s strategy is to deliver value through participation in exploration and appraisal programmes focusing on deep-water petroleum systems. The Company concentrates on young and emerging basins, de-risked through 2D and 3D seismic surveys, and aims to participate in multi-well drilling programmes through farm-ins, farm-outs and M&A activity. Discover holds a PSC offshore in the Comoros that was signed by the Comoros Government in March 2013 and ratified by the National Assembly of the Comoros in March 2014. Discover also has a pipeline of other opportunities to acquire additional participations in attractive exploration blocks across the globe. In addition, Discover will seek early value creation through participation at ground floor level in targeted areas, where large interests are available. The Company has solid industry relationships and works with reliable, well-financed and proven partners to build a balanced portfolio of exploration assets with both oil and gas potential. The Carlyle Group (NASDAQ: CG) is a global alternative asset manager with approximately $189 billion of assets under management across 118 funds and 106 fund of funds vehicles as of December 31, 2013. Carlyle's purpose is to invest wisely and create value on behalf of its investors, many of whom are public pensions. Carlyle invests across four segments – Corporate Private Equity, Real Assets, Global Market Strategies and Solutions – in Africa, Asia, Australia, Europe, the Middle East, North America and South America. Carlyle has expertise in various industries, including: consumer & retail, energy, financial services, aerospace, defense & government services, healthcare, industrial, real estate, technology & business services, telecommunications & media and transportation. The Carlyle Group employs more than 1,500 people in 34 offices across six continents. Carlyle has carefully constructed a broad-based energy investing platform (over $25bn in AUM) offering innovative investment opportunities, including international energy investing in oil & gas exploration & production, midstream, oil field services and refining & marketing in Europe, Africa, Latin America and Asia (CIEP), U.S. energy investing (NGP Energy Capital Management where Carlyle owns 47.5% of revenues), project finance (Energy Mezzanine), Power (Cogentrix) and Commodities (Vermillion) and the firm’s proven buyout capabilities in transactions such as Philadelphia Energy Solutions and Kinder Morgan. Supporting this is the Carlyle network and capital markets experience. Established in May 2013, the CIEP team focuses on oil and gas exploration and production midstream, oil field services and refining and marketing in Europe, Africa, Latin America and Asia. CIEP is led by Marcel van Poecke, a leading international energy investor and operator, and his team is comprised of long-tenured international energy professionals with oil and gas industry investment and operational expertise. It includes Paddy Spink, Senior Advisor to CIEP with 35 years’ upstream experience in Africa, Latin America & Europe, Carlyle Managing Director Joost Dröge, an industry veteran with over 25 years’ downstream experience in Europe and Bob Maguire, recently appointed CIEP Managing Director who has 30 years of experience covering the energy industry. The CIEP team focuses on transactions where it has a distinctive competitive advantage and can create tangible value for companies in which it invests, through industry specialization, deployment of human capital and access to Carlyle’s global network. The team operates primarily from offices in London while leveraging Carlyle’s local offices to pursue opportunities across Europe, Africa, Asia and Latin America and is reinforced by Carlyle’s regional fund teams and global investment professionals. CIEP has already made two investments in Discover and in Varo Energy. The Union of the Comoros is an archipelago located in the Mozambique Channel, between Northern Mozambique and Northern Madagascar. It is a constitutional democracy, recognised by the United Nations, that became independent from France in 1975. The President of the Comoros, His Excellency Dr. Ikililou Dhoinine, was elected in May 2011. The government sits in the capital Moroni. Each of the three islands has also a democratically elected local government. The population is 766,865 (July 2014 est.). The GDP is US$911m (2013 est.) with the main exports being vanilla, cloves and essential oils.